One of the reasons preventive care visits are so important is they leave you with a cleaning and full examination. The former helps to remove harmful plaque and tartar that could otherwise contribute to teeth and gum health problems. While visiting, you’ll also undergo a complete oral cancer screening. 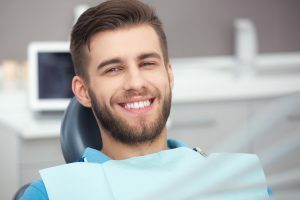 This is vital to have done because if there are any signs of the disease, you can immediately start formulating a treatment plan with your dentist. Statistics show that with early detection and treatment, the five-year survival rate is 75%, but if the symptoms are ignored until the disease worsens, that number falls drastically to 20%. What Symptoms Will Your Dentist Look for? Because oral bacteria have been found to be such major contributors to the development of oral cancer, it’s of the utmost importance to practice excellent oral hygiene, which includes brushing and flossing your teeth at least two times a day. It’s also a good idea to drink plenty of water. This helps to flush your mouth of any lingering food particles after you eat, and the moist environment makes it harder for bacteria to survive. You should also limit your consumption of foods high in sugar. That’s because the latter happens to be the most desirable form of sustenance for bacteria to feed on. Maintaining excellent oral health and preventing the development of oral cancer are priceless, so to experience the joys of this happening for you, contact your dentist to schedule a preventive care visit today! Dr. Melinda Duncan is a graduate of the University of Tennessee Health Science Center. Throughout her career, she has focused on providing the best in oral care, which is why she maintains professional affiliation with the Academy of General Dentistry. Dr. Duncon helps patients experience the peace-of-mind of preventing oral cancer at Market Heights Family Dental, and she can be reached for more information through her website.